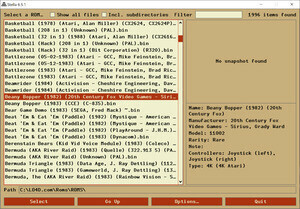 Stella emulates most Atari 2600 peripheral devices, including standard joysticks, paddle controllers, the Atari Video Touch Pad, the Atari Keyboard Controller, Atari Indy 500 Driving Controllers, the CBS Booster-Grip controller, the CX-22/CX-80/AmigaMouse trackball controllers, the Sega Genesis controller, and the AtariVox and SaveKey controllers. Stelladaptor and 2600-daptor support allows real joysticks, paddles, and driving controllers to be used, and support is also included to access a real AtariVox device plugged into a serial port (and actually generate sound from the AtariVox device). For security reasons, you should also check out the Stella download at LO4D.com which includes virus and malware tests. Additional screenshots of this application download may be available, too. Stella download been highly rated by our users.